Hi, I’m Kira DeDecker (“key-ra dee-decker”) and I’m a pet photographer serving Arizona’s greater Phoenix Metro area. Welcome to my blog! This is where I share not only my most recent work but also my life with you. Client sneak peeks, Facebook recaps, announcements, updates, awesome new offerings and the occasional (okay, frequent) story about my crazy but amazing life with my three dogs – Sox, Bixby and Waffles. Pull up a chair and make sure it’s nice and comfy because you will want to stay awhile. It’s great to have you here! I had an amazing, sun-kissed photoshoot at the Boyce Thompson Arboretum with Barron and his family. I knew it was going to be a fun-filled session the moment I met Barron. At our pre-consult he started showing off all his tricks and training and just to add to his amazingness he knew how to work the camera from the get-go. With a meeting like that, I knew our session was going to be breeze, and he did not disappoint! Barron is a young Vizsla who loves treats (he went crazy for my Stella and Chewy Beef treats) and his people. The images were filled with love, it’s obvious the tight bond they have for each other! Oh, to be Barron! After working all morning, in the middle of a pose, Barron decided to have an impromptu snack. Thank you Ron and Carol for introducing me Barron and for entrusting me with capturing your images. Great shots, that last one is classic. Very typical Vizsla to munch grass. I call Luna my goat, she is ridic about eating grass. Haha I love it! I had no idea that it was a Vizsla thing! 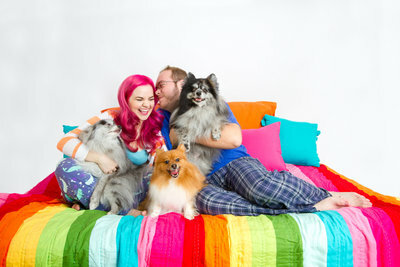 Kira DeDecker is an on-location lifestyle pet photographer specializing in one-of-a-kind fine art and modern portraits. She works exclusively with dogs, cats and all other four legged creatures to create vibrant, quirky and soulful works of art.She also photographs needy animals pro-bono for non-profit animal organizations (like Cavalier Rescue USA). Kira DeDecker Photography is a editorial and commercial pet photographer based in Glendale AZ and serves the Metro Phoenix area (Scottsdale, Peoria, Phoenix, Suncity, Surprise, Goodyear, Avondale and Tempe) and beyond.